This trek offers very varied landscapes and botany from cultivated areas including lush oasis gardens under the shade of palms, almond and walnut trees and ancient olive groves to wilder areas of argan forest, thuya forest, rivers fringed with oleander, a gorge, river pools suitable for swimming and sparsely-vegetated ridges. The walk leads you over low passes and through sleepy villages and hamlets. Starting from Taroudant, the excursion begins with a scenic drive northwards into an area of the Western High Atlas rarely visited by foreigners. The drive, along a newly built dead-end road, passes through hillsides dotted with argan trees, then as you climb to higher altitudes the Barbary thuya tree (famous for the scented wood used in marquetry) appears and finally you begin to enjoy views of the lofty High Atlas Mountains. There are a number of optional routes, either circular or linear. The walk normally starts in the Irguiten Valley and climbs over into the Mentaga Valley to the east. The trek normally begins with a walk along a track which links a number of small villages and then descends into the scenic Mentaga Valley at Afensou (at an altitude of 800m) from where there are excellent views of the peak of Jbel Aoulime (3555 metres) which is snow-capped in winter. 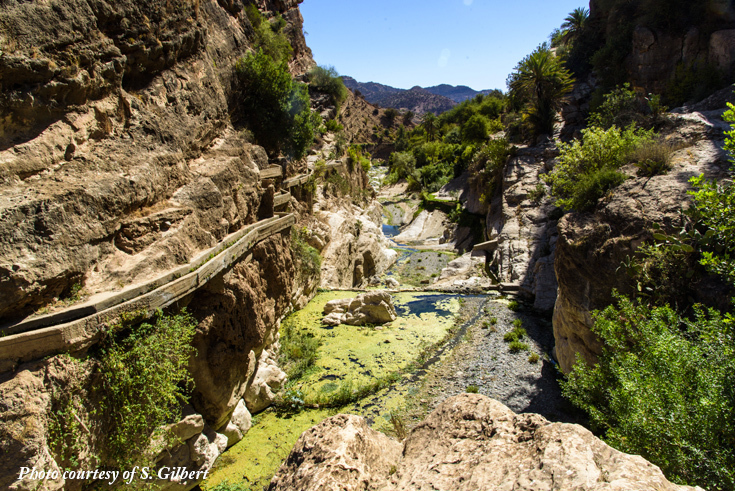 You then pass through oasis gardens and along the side of a gorge where there are lovely pools that often tempt visitors to don their swimwear (about 3 5 hours walking). Returns to the starting point is via another route on the other side of the river(about 1.5 hours' walk). An alternative linear route involves continuing downstream to a pick-up point. Nearby is Imoulass, a Berber village nestling high up in the foothills of the Tichka Plateau, it was once the trailhead for the old caravan routes from Mauritania. Walking is easy but there are some rough surfaces and moderate gradients over short distances; walking boots or shoes are therefore strongly recommended.